Kippy Vita is a revolutionary solution for our four-legged friends. Hook the Kippy Vita device to the collar of your pet to track down its position on the map via GPS. The Kippy VITA GPS Pet Tracker & Activity Monitor is the first device that combines GPS tracking and monitoring of the motor activity designed for pets. All recorded data will always be available and easy to understand and display on your smartphone, tablet or computer: Kippy Vita puts you in touch with your pet with constant updates and in real time. 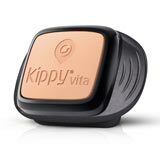 Kippy Vita is a complete instrument that includes the device to attach to the collar, the dedicated application and the tracking service even abroad. When you buy the Kippy VITA GPS Tracker it includes a FREE 12 month tracking licence for sending data from the GPS tracking collar to the cloud via the Vodacom network. No SIM card is required as this is built directly into the GPS tracking collar. After the initial 12 months, you can optionally extend the tracking licence for a further 12 months. This 12 month license costs 30 Euro's for the year. (aprox. R 465.00 @ R15.50) , which enables the GPS tracking collar to send data to the cloud, which is then downloaded to the App on your smartphone or tablet showing you the location of your pet as well as their activity log. The 12 month tracking license can be paid directly via the app on your smartphone. Easy and quickly. GPS - Check your pet position directly on the map. Proximity - Find out how far Kippy Vita is from you and how to reach it. Geofence - Draw a virtual fence of minimum 100m radius and get a warning if your pet leaves the selected area! Vita - Stay always connected with your pet and receive lots of tips on how to improve your pets daily well being. Motion - Display the summary of all the motor activities of your pet. Activity Detail - Analyse and scroll the data for each single activity. Extra-Grip Connection - Made of steel and extra-grip of Velcro. It will assist in a perfect adherence to the collar everywhere, even with very active pets! Waterproof - Rain and splash proof, not made to be submerged! Rechargeable - Extra long life battery thanks to a 1150mAh battery. Up to 16 days in standby mode. Anti Shock - Its soft touch plastic and the ABS shell are designed to protect the electronic parts against any shock or shakes. GPS Assisted - Locates your pet in real time with improved satellite connection. Activity Tracking - Kippy Vita allows you to monitor the activities of your pet throughout the day. Calorie consumption - Calculate the daily calorie consumption of your pet based on the data and on the activities performed thanks to algorithms validated by the University of Bologna. Always with you - It connects to your smartphone from any distance thanks to Vodafone and partners international mobile network.